Release date: 24th July 2017! Blockbuster slot in the making! 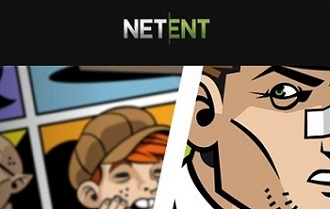 Wow, this has taken me be surprise as I looked up Netent’s site today to see what will be upcoming in the next few weeks. Earlier this year they announced a Universal Monsters™ title leaving everybody guessing as to which blockbuster they will chose. Today it was finally revealed as I got my hands on a game sheet for the Phantom of the Opera™ slot, due for release on 24th July 2017. And it looks pretty special at first sight with a opera theater as background and a frameless game window. Phantom of the Opera™ will be a 5-reel, 4-row, 40-pay lines (fixed) video slot, paying both ways with stacked symbols, Wild substitutions, a Pick-and-Click Bonus Game, Free Spins and a random Phantom Re-Spin feature. That sounds all pretty exciting, let’s see what other details I was able to dig out, although no preview play was available to get a real feel for this slot. 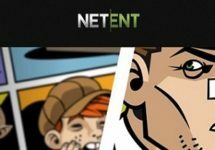 Netent has given to what seems to be a low – medium variance game a TRTP of 96.57% and a maximum win on a single pay line of 4,000 coins or 20x stake. Not an awful lot but considering that all symbols are stacked it could lead to a total win of 160,000 coins or 800x bet with a full screen of the top symbol. Bet sizes range from $0.20 – $200, adjusted with the usual controls and buttons for coin denominations and bet levels. 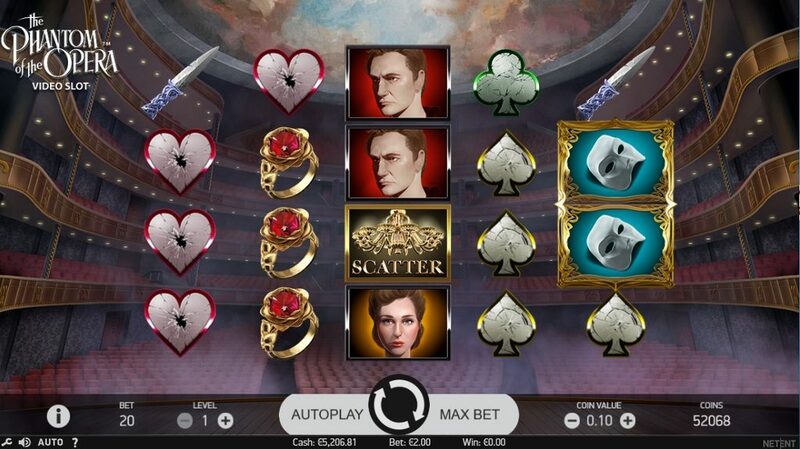 The slot will be in HTML5 format available on desktop, mobile and tablet across all OS platforms. Pay symbols start at the low end with clubs, spades, hearts and diamonds and continue on the medium level with a knife, a white pearl, a yellow rose and a ring with a red gem. Top symbols are Christine and the Phantom. Pays for 5OAK range from 20 to 200 coins. There are a range of Phantom Wild symbols while scatters are a traditional Chandelier. The Masked Phantom Re-Spin is triggered when a Stacked Phantom symbol lands on reel 1 and a Stacked Mask symbol lands on reel 5. The Bonus Stacked Symbols, as well as Mask symbols and Phantom symbols visible during the spin that activated the Re-Spin, turn into Wilds and stick on the reels for one free Re-Spin. Stage 1 – pick from 8 roses with some of them having coin wins in them and some having blockers (a X sign). Stage 2 – once the blocker is revealed the game goes to stage 2 where players pick one of 3 mirrors to uncover a multiplier of x1, x2 or x3. 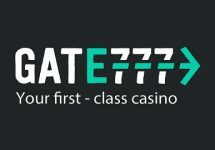 Three Chandelier Scatters landing on reels 1, 3, and 5 will award the Free Spins feature. During Free Spins, a chandelier hangs by ropes above the reels with a section of the rope being cut every time a Phantom symbol lands on the reels. When all five ropes next to the reels are cut, the chandelier falls and Free Spins end. The Phantom symbol also acts as a Wild symbol in Free Spins. When a Masked Phantom symbol lands on a reel and cuts the rope section, all Masked Phantom symbols on that reel become fully stacked Masked Phantom symbols from the next spin, and remain stacked, for the remaining Free Spins session. 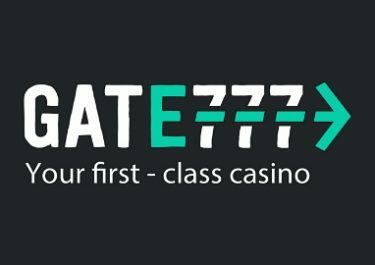 The announcement of this game took me indeed by surprise and it looks like it is going to be a entertaining slot with some new pay mechanisms and Free Spin features. However, it falls into the same row of low – medium variance games that Netent has mostly produced in the past 2 years which can give long slotting sessions even with smaller balances but all that at the expense of mega win potential. Small to medium wins will be happening probably often enough but I would not expect something a la Jungle Spirit: Call of the Wild™ where wins can go up to 7,680 x bet. 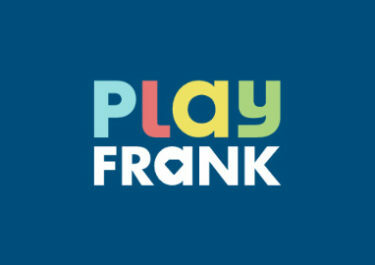 We will be much wiser once the game is released for pre-play and I will surely update this page with new screenshots.